Business Process Management (BPM) has become one of the most widely used approaches for the design of modern organizational and information systems. The conscious treatment of business processes as significant corporate assets has facilitated substantial improvements in organizational performance but is also used to ensure the conformance of corporate activities. This Handbook presents in two volumes the contemporary body of knowledge as articulated by the world's leading BPM thought leaders. 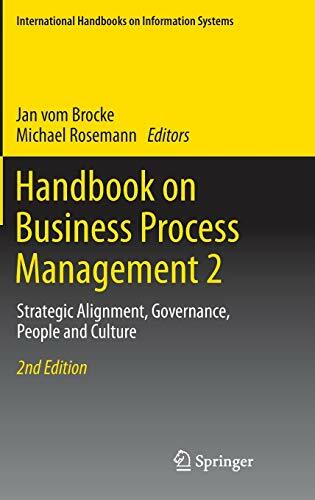 This second volume focuses on the managerial and organizational challenges of BPM such as strategic and cultural alignment, governance and the education of BPM stakeholders. As such, this book provides concepts and methodologies for the integration of BPM. Each chapter has been contributed by leading international experts. Selected case studies complement their views and lead to a summary of BPM expertise that is unique in its coverage of the most critical success factors of BPM. Jan vom Brocke holds the Martin Hilti Chair in Business Process Management (BPM) at the University of Liechtenstein. He is Director of the Institute of Information Systems and President of the Liechtenstein Chapter of the Association of Information Systems (AIS). Jan has more than ten years of experience in BPM projects and serves as an advisor to a wide range of institutions. He has published his work in more than 150 refereed papers at internationally perceived conferences and journals and is an invited speaker on BPM at a number of universities, such as the University of St. Gallen in Switzerland, the LUISS University in Italy, or the University of California at Berkeley. In Liechtenstein, Jan is initiator and academic director of Europe’s first international university Master Program in Business Process Management. His PhD students regularly take part in doctoral consortia, two of which have just recently been awarded junior research fellows of the Third Lindau Nobel Prize Laureates Meeting in Economic Sciences. Michael Rosemann is a Professor and Co-Leader of the Business Process Manage­ment Group at Queensland University of Technology, Brisbane, Australia. His research areas are Business Process Management, Enterprise Systems and conceptual modeling. He is the author/editor of seven books and more than 140 refereed papers (incl. MISQ, IEEE TKDE, JAIS, DSS, Information Systems) and Editorial Board member of seven international journals. His publications have been translated into German, Russian, Portuguese and Mandarin. Dr Rosemann’s PhD students have won the Australian award for the best PhD thesis in Information Systems in 2007 and in 2008. He is the founder and chair of the Australian BPM Community of Practice and he has been the Chair of the 5th Inter­national Business Process Management Conference in 2007. He regularly conducts executive training in BPM and provided BPM-related advice to organizations from various industries, including telecommunications, banking, insurance, utility, retail, public sector, logistics and film industry.